The following summarizes the general geological settings of the various properties making up the LIM's project. The regional geological descriptions herein are based on published reports by Gross (1965), Zajac (1974), Wardel (1979) and Neale (2000). At least 45 hematite-goethite ore deposits have been discovered in an area 20km wide that extends 100 km northwest of Astray Lake, referred to as the Knob Lake Iron Range, which consists of tightly folded and faulted iron formations exposed along the height of land that forms the boundary between Quebec and Labrador. The iron deposits occur in deformed segments of iron formation, and the ore content of single deposits varies from one million to more than 50 million tonnes. The Knob Lake properties are located on the western margin of the Labrador Trough adjacent to Archean basement gneisses. The Labrador Trough extends for more than 1,000km along the eastern margin of the Superior craton from Ungava Bay to Lake Pletipi, Quebec. The belt is about 100km wide in its central part and narrows considerably to the north and south. The western half of the Labrador Trough, consisting of a thick sedimentary sequence, can be divided into three sections based on changes in lithology and metamorphism (North, Central and South). The Trough is comprised of a sequence of Proterozoic sedimentary rocks including iron formation, volcanic rocks and mafic intrusions known as the Kaniapiskau Supergroup (Gross, 1968). The Kaniapiskau Supergroup consists of the Knob Lake Group in the western part of the Trough and the Doublet Group, which is primarily volcanic, in the eastern part. The Central or Knob Lake Range section extends for 550km south from the Koksoak River to the Grenville Front located 30km north of Wabush Lake. The principal iron formation unit, the Sokoman Formation, part of the Knob Lake Group, forms a continuous stratigraphic unit that thickens and thins from sub-basin to sub-basin throughout the fold belt. The southern part of the Trough is crossed by the Grenville Front. Trough rocks in the Grenville Province to the south are highly metamorphosed and complexly folded. 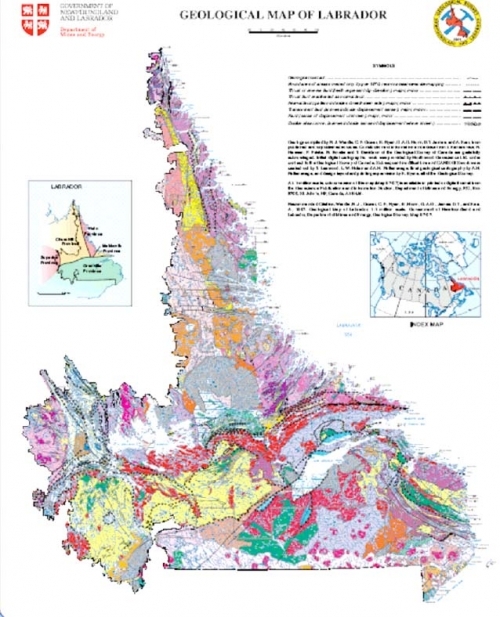 Iron deposits in the Grenville part of the Labrador Trough include Lac Jeannine, Fire Lake, Mounts Wright and Reed and the Luce, Humphrey and Scully deposits in the Wabush area. The high-grade metamorphism of the Grenville Province is responsible for recrystallization of both iron oxides and silica in primary iron formation producing coarse-grained sugary quartz, magnetite, specular hematite schists (meta-taconites) that are of improved quality for concentrating and processing. The main part of the Trough north of the Grenville Front is in the Churchill Province and has been subjected to low-grade (greenschist facies) metamorphism. In areas west of Ungava Bay, metamorphism increases to lower amphibolite grade. The mines developed in the Schefferville area by IOC exploited residually enriched earthy iron deposits derived from taconite-type protores. Geological conditions throughout the central division of the Labrador Trough are generally similar to those in the Knob Lake Range. The general stratigraphy of the Knob Lake area is representative of most of the range, except that the Denault dolomite and Fleming Formation are not uniformly distributed. The Knob Lake Range occupies an area 100km long by 8km wide. The sedimentary rocks including the cherty iron formation of this area are weakly metamorphosed to greenschist facies. In the structurally complex areas, leaching and secondary enrichment have produced earthy textured iron deposits. Unaltered banded magnetite iron formation, often referred to as taconite, occurs as gently dipping beds west of Schefferville in the Howells River deposits. The sedimentary rocks in the Knob Lake Range strike northwest, and their corrugated surface appearance is due to parallel ridges of quartzite and iron formation which alternate with low valleys of shales and slates. The Hudsonian Orogeny compressed the sediments into a series of synclines and anticlines, which are cut by steep angle reverse faults that dip primarily to the east. The synclines are overturned to the southwest with the east limits commonly truncated by strike faults. Most of the secondary earthy textured iron deposits occur in canoe-shaped synclines; some are tabular bodies extending to a depth of at least 200 metres, and one or two deposits are relatively flat lying and cut by several faults. In the western part of the Knob Range, the iron formation dips gently eastward over the Archean basement rocks for about 10km to the east, then forms an imbricate fault structure with bands of iron formation, repeated up to seven times. Subsequent supergene processes converted some of the iron formations into high-grade ores, preferentially in synclinal depressions and/or down-faulted blocks. Original sedimentary textures are commonly preserved by selected leaching and replacement of the original deposits. Jumbled breccias of enriched ore and altered iron formations, locally called rubble ores, are also present. Fossil trees and leaves of Cretaceous age have been found in rubble ores in some of the deposits (Neal, 2000). Attikamagen Formation - is exposed in folded and faulted segments of the stratigraphic succession where it varies in thickness from 30 metres near the western margin of the belt to more than 365 metres near Knob Lake. The lower part of the formation has not been observed. It consists of argillaceous material that is thinly bedded (2 3mm), fine grained (0.02 to 0.05mm), grayish green, dark grey to black, or reddish grey. Calcareous or arenaceous lenses as much as 30 cm in thickness occur locally interbedded with the argillite and slate, and lenses of chert are common. The formation grades upwards into Denault dolomite, or into Wishart quartzite in area where dolomite is absent. Beds are intricately drag-folded, and cleavage is well developed parallel with axial planes, perpendicular to axial lines of folds and parallel with bedding planes. Denault Formation - is interbedded with the slates of the Attikamagen Formation at its base and grades upwards into the chert breccia or quartzite of the Fleming Formation. The Denault Formation consists primarily of dolomite, which weathers buff-grey to brown. Most of it occurs in fairly massive beds which vary in thickness from a few centimetres to about one metre, some of which are composed of aggregates of dolomite fragments. Near Knob Lake the formation probably has a maximum thickness of 180 metres but in many other places it forms discontinuous lenses that are, at most, 30 metres thick. Leached and altered beds near the iron deposits are rubbly, brown or cream colored and contain an abundance of chert or quartz fragments in a soft white siliceous matrix. Fleming Formation - occurs a few kilometres southwest of Knob Lake and only above dolomite beds of the Denault Formation. It has a maximum thickness of about 100 metres and consists of rectangular fragments of chert and quartz within a matrix of fine chert. In the lower part of the formation the matrix is dominantly dolomite grading upwards into chert and siliceous material. Wishart Formation - Quartzite and arkose of the Wishart Formation form one of the most persistent units in the Kaniapiskau Supergroup. Thick beds of massive quartzite are composed of well-rounded fragments of glassy quartz and 10 30% rounded fragments of pink and grey feldspar, well cemented by quartz and minor amounts of hematite and other iron oxides. Fresh surfaces of the rock are medium grey to pink or red. The thickness of the beds varies from a few centimetres to about one metre but exposures of massive quartzite with no apparent bedding occur most frequently. Ruth Formation - Overlying the Wishart Formation is a black, grey-green or maroon ferruginous slate, 3 to 36 metres thick. This thinly banded, fissile material contains lenses of black chert and various amounts of iron oxides. It is composed of angular fragments of quartz with K-feldspar sparsely distributed through a very fine mass of chlorite, white mica, iron oxides and abundant finely disseminated carbon and opaque material. Much of the slate contains more than 20% iron. Sokoman Formation - More than 80% of the ore in the Knob Lake Range occurs within this formation. Lithologically the iron formation varies in detail in different parts of the range and the thickness of individual members is not consistent. A thinly bedded, slaty facies at the base of the formation consists largely of fine chert with an abundance of iron silicates and disseminated magnetite and siderite. Fresh surfaces are grey to olive green and weathered surfaces brownish yellow to bright orange where minnesotaite is abundant. Thin-banded oxide facies of iron formation occurs above the silicate-carbonate facies in nearly all parts of the area. The jasper bands, which are 1.25 cm or less wide and deep red, or in a few places greenish yellow to grey, are interbanded with hard, blue layers of fine-grained hematite and a little magnetite. The thin jasper beds grade upwards into thick massive beds of grey to pinkish chert and beds that are very rich in blue and black iron oxides. These massive beds are commonly referred to as 'cherty metallic' iron formation and make up most of the Sokoman Formation. The iron oxides are usually concentrated in layers a few centimetres thick interbedded with leaner cherty beds. In many places iron-rich layers and lenses contain more than 50% hematite and magnetite. The upper part of the Sokoman Formation comprises beds of dull green to grey or black massive chert that contains considerable siderite or other ferruginous carbonate. Bedding is discontinuous and the rock as a whole contains much less iron than the lower part of the formation. Menihek Formation - A thin-banded, fissile, grey to black argillaceous slate conformably overlies the Sokoman Formation in the Knob Lake area. Total thickness is not known, as the slate is only found in faulted blocks in the main ore zone. East or south of Knob Lake, the Menihek Formation is more than 300 metres thick but tight folding and lack of exposure prevent determination of its true thickness. The Menihek slate is mostly dark grey or jet black. It has a dull sooty appearance but weathers light grey or becomes buff colored where leached. Bedding is less distinct than in the slates of other slate formations but thin laminae or beds are visible in thin sections.